Located in the centre of Paris, in the 15th arrondissement, this modern property is near the Montparnasse station. The hotel has a restaurant and a bar, with a terrace. Free Wifi is available everywhere in the hotel. 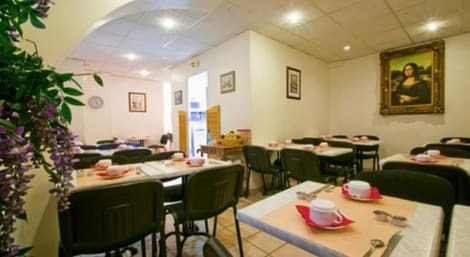 Located at the door of Paris, near Porte Maillot and the Arc de Triomphe, this hotel is convenient for families as well as couples or business travellers. Modern, large rooms with all amenities of a 4 star. Found near the Seine and some of the city’s most famous sights, this modern 4-star aparthotel is an excellent choice for seeing the city, and has several metro stations nearby. The aparthotel has a 24-hour reception service and luggage storage room, as well as a pool and fitness facilities. Each apartment is furnished in a modern style, with kitchen facilities, flat-screen TVs and free wi-fi. Located in the 11th arrondissement in the bohemian Marais district & close to the Bastille this 4-star hotel is ideally located for taking in both Paris’ history & its lively nightlife. Decorated throughout in a colourful & contemporary style all rooms have LCD TVs & private marble-finished bathrooms & there is a bar & modern French restaurant onsite. Visit the nearby Church of Saint-Denys of the Holy Sacrament to see the inspirational art including work by Delacroix. Location This hotel is located in Paris' 18th district near to the Sacré Coeur. Place du Tertre and the northern Paris flea market are just a few minutes away. The nearest métro station is Marcadet-Poissonniers. 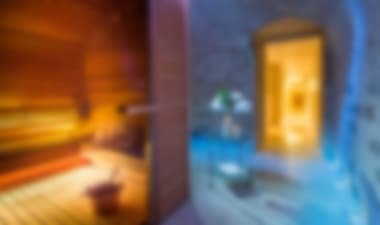 This 2 star hotel is located in the city centre of Paris and was established in 1950. It is close to the Place de la Republique and the nearest station is Republique. The Hotel has a restaurant. Hotel de France is located in Paris’ 18th district, just 600 metres from the Sacré-Coeur Basilica and 160 metres from Marcadet-Poissonniers Metro Station. The hotel offers free Wi-Fi internet access. The guest rooms at Hotel de France include a minibar and a flat-screen TV with cable and satellite channels. Some have a private bathroom and some have a washbasin and shared bathroom facilities. Many bars, shops and restaurants are found in the lively area next to the hotel. A luggage storage is available on site. Gare du Nord is 1 km from the hotel. The property is 1.4 km from Pigalle and 1.8 km from the Moulin Rouge. Les Docks de Paris Event Venue is 2.6 km away. 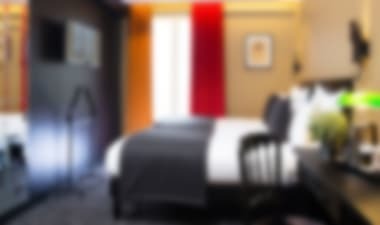 The ibis Paris Porte de Montreuil hotel provides direct access to the center of Paris (Metro L9 in 15 minutes). A 3-star hotel located to the east of Paris with access to the Villepinte exhibition center (20 minutes by car) and Bercy Arena (15 minutes bymetro). The Vincennes Zoo and Castle are nearby, and Montreuil's weekend flea market is right in front of the hotel. Parc Asterix is 18.6 miles (30 km) from the hotel and Disneyland is 45 minutes away by RER A. With a stay at Hotel Liberty, you'll be centrally located in Paris, just a 5-minute walk from Grands Boulevards and 8 minutes by foot from Canal Saint-Martin. This hotel is 0.5 mi (0.8 km) from Place de la Republique and 0.7 mi (1.1 km) from Grand Rex Cinema. Make yourself at home in one of the 48 air-conditioned rooms featuring iPod docking stations and LED televisions. Complimentary wireless Internet access keeps you connected, and satellite programming is available for your entertainment. Private bathrooms with showers feature rainfall showerheads and complimentary toiletries. Conveniences include phones, as well as laptop-compatible safes and desks. 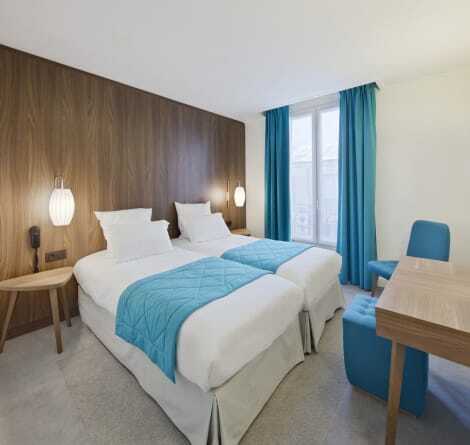 Found in the trendy 17th arrondissement, a bustling neighbourhood that offers a more authentic view of Paris than the usual tourist spots, this smart 3-star hotel is close to the Clichy-Levallois station and the Metro, making it easy to explore the city. 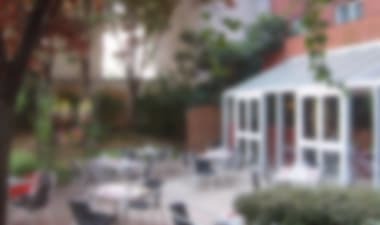 The hotel has a pleasant bistro, serving traditional Parisian cuisine, a bar and an attractive garden. With a stay at Hipotel Paris Gare du Nord Merryl, you'll be centrally located in Paris, within a 15-minute drive of Canal Saint-Martin and Moulin Rouge. This hotel is 1.8 mi (2.9 km) from Grevin Museum and 1.9 mi (3.1 km) from Galeries Lafayette. Paris impresses everyone who is lucky enough to visit. With its romantic reputation, historical sites and artistic standing it draws countless tourists every year. And while there you can rest easy with an impressive array of Paris hotels to meet your accommodation needs. Parisian’s love of art is writ large in museums such as the Louvre, home of Egyptian, Greek and Roman antiquities and, of course, the Mona Lisa. You can find great works by Cézzane, Monet, Renoir, Van Gogh and many others at Musée d'Orsay, a spectacular building that is a former railway station. And at Musée des Arts Forains you'll discover a very unusual collection of privately owned exhibits, including antique carnival rides and games. Ascend to the summit of the iconic iron lattice Eiffel Tower and find yourself more than 300 metres above street level. From here you'll have unparalleled 360° views of the city. The French Gothic Notre-Dame Cathedral dominates the very centre of Paris on an island that is surrounded by the waters of the River Seine. At the western end of the Champs-Élysées stands the Neoclassical Arc de Triomphe from which avenues radiate like spokes on a wheel. And dominating Montmartre is the ever-white Sacré-Cœur, a beautiful Romano-Byzantine construction whose main dome provides even more splendid views of the city. Paris is a hive of theatres, opera houses and live music venues. Jump on the Métro and take in a cabaret at the Moulin Rouge or enjoy a stunning production at Opera National de Paris within the splendid Palais Garnier. The French have long had a love affair with cinema, whether watching or creating it. Cinephiles will love the choice of movie houses such as La Cinémathèque Française and Le Champo, where you can watch more than the usual multiplex fare. Paris is famed for its gastronomy and there is an amazing choice of eateries from the chic rusticity of Seb'on to the high-end sophistication of Epicure. Foodies will be attracted to the markets that line the Rue Mouffetard. Here you'll experience the heady aroma of cheeses and roasting birds, freshly made baguettes and crêpes, as well as chocolates, fruit and vegetables. Paris is a fashion capital of the world, and for haute couture, Avenue Montaigne and Avenue des Champs-Elysées are great places to start. 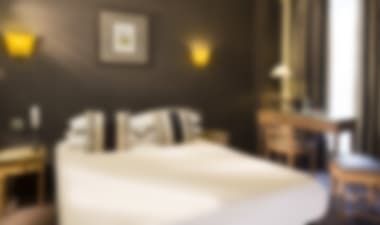 At lastminute.com we have a huge choice of hotels to suit your needs, whether staying in the heart of the capital or somewhere within easy access from the outskirts. The Première Classe Roissy can be reached quickly from the city centre, providing a great option for a modest budget. Enjoy 3-star quality right next to the River Seine with Hotel de Notre Dame. And for 5-star elegance and luxury, De Vigny Hotel, situated within minutes of the Arc de Triomphe has a touch of class.